There are so many New York Yankees that are known to being exceptionally kind people. Roy White is one of them and with all the great stars in baseball, people tend to forget Mr. White, but I don't and I never have. He is known as one of the most motivated and friendly Yankees ever and he never turns down his fans. Luckily for us at Bleeding Yankee Blue, we were able to get an interview with him courtesy of Jason Zweig and Doug Drotman of Drotman Communications. Thanks guys. I have always respected Roy White and I feel like he's always there to either guide the players as a coach, take pictures with the fans or even be a spokesperson for important causes. The Damon Runyon Cancer Research Foundation and the Runyon 5K Run are important causes to me because people very close to me have been affected by cancer. We here at Bleeding Yankee Blue found it super important to bring this cause to your attention and if you are interested, please click on Runyon 5k Run and register. The event takes place at Yankee Stadium on August 7th and Roy White is the official starter for the run. Be sure to check it out. And now we bring you... Mr. Roy White. 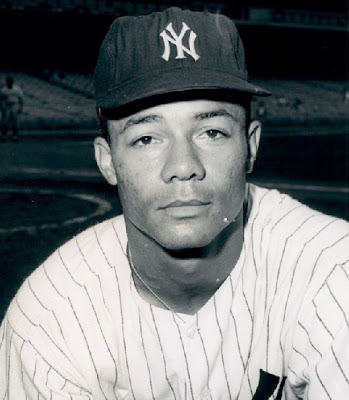 BYB: You made your Yankees debut in 1965. Describe the feeling of your first at bat as a New York Yankee. Roy White: It came in the first game of a double header against a guy named McNally. I was extremely nervous because there were 35,000 people watching me and we never had more than 4 or 5,000 in the minors. I remember I was just shaking in my uniform but I ended up hitting a line drive up the middle for a base hit. BYB: You were part of 2 championship teams in 1977 and 1978, plus you won the AL pennant in 1976. Was it clear to you looking back that you had a team that could win it all and why? Roy White: After 1976 it was clear to us. We weren’t prepared for that first series with the Reds; we ended up getting swept 4-0. We came into that series with only one days rest and mentally we weren’t ready. The next year we were all very anxious because we knew we had a very good team plus we added Reggie and Bucky. BYB: If you only had to chose just 1 player, which New York Yankee player did you consider yourself closest to during your time on the Yankees in the 1970’s and why? BYB: You made the All-Star team in 1969 and 1970. Clearly that is a game the most talented get chosen to play. What was it like when you found out you had been chosen? Roy White: It was unbelievable. I thought that I had no shot because fans didn’t vote back then it was up to the players and managers. Mayo Smith who was the manager of the Detroit Tigers at the time picked me. Being on the same field as guys like Willie Mays, Hank Aaron, Al Kaline, and Frank Robinson is a position I never thought that I would be in. BYB: What was it like playing for Billy Martin? Roy White: Very exciting. He was unpredictable so you always had to be on your toes. He let us play a very wide-open type of baseball. He let us steal a lot of bases and run a lot more so we had a lot of freedom. BYB: What is your fondest memory as a New York Yankee? Roy White: I would say getting to our first World Series. When Chris Chambliss hit that home run to put us on top against the Royals and into the World Series was something I will never forget. BYB: You were the first base and outfield coach for Joe Torre’s 2004-2005 teams. What was it like to work with such a talented manager like Joe Torre? Roy White: Great because he let you do your job. He let you be responsible and didn’t run the whole show and he would ask your input on certain things. There was no better manager to work for. BYB: A lot of people don’t know that you played baseball in Japan. Describe going from an American Dynasty like the New York Yankees, to then playing for a Japanese Dynasty like the Yomiuri Giants? Roy White: The whole experience was eye opening. 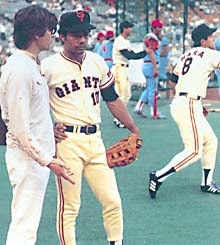 The Tokyo Giants were bigger and the whole country loved them. Not everyone in America likes the Yankees. I couldn’t believe how many fans they had. BYB: Tell me about the Roy White Foundation and the Roy White All-Stars? Roy White: The Roy White Foundation was created to provide students with financial assistance for college. Books and baseball was kind of our slogan because I read a lot and reading was very important to me. We would pay the textbook cost for the first two semesters for students. BYB: You will be serving as the Official Starter for the Runyon 5K Run at Yankee Stadium on August 7th. This cause is to raise money for the Damon Runyon Cancer Research Foundation. How did you become apart of it and why is it important that people turnout to this event? Roy White: It came through Marty Appel and he asked me to do it. It is a great cause because everyone has someone close to them who has been affected. It is a great event they put on at Yankee Stadium so it was a win, win and a no brainer. For more information, check out the website http://www.damonrunyon.org/yankeestadium. Again, you can register or even donate, but make sure you check it out. Mr. White, you are a stand up guy and we appreciate you so much here at Bleeding Yankee Blue. Much respect sir, Thank you. So great to hear from Roy White. Nice job BYB. 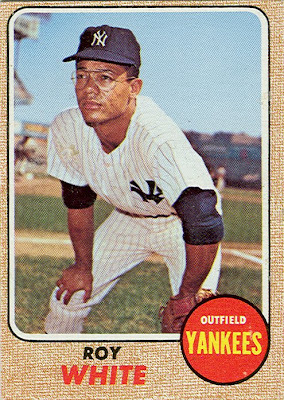 He is clearly one of the most underrated Yankees on those '77 & '78 WS teams. Very admirable to see what he doing today with the Roy White Foundation!